← Google Library Project Legal: Let the Robots Read! Reflections on From Clay to the Cloud: The Internet Archive and Our Digital Legacy, a.k.a. The Internet Archive – The Exhibition! It started with a visit to Nuala Creed’s ceramics studio in Petaluma in the spring of 2014. 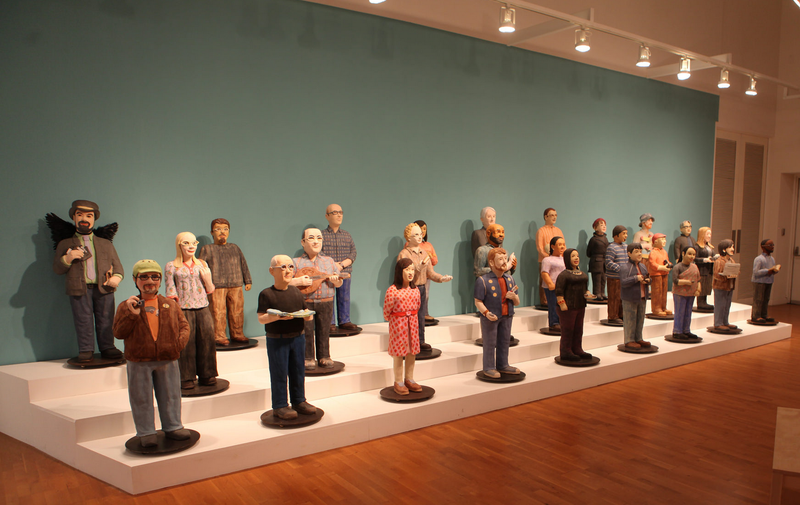 My interest was piqued as she described “a commission of sculptures for the Internet Archive” that was ever-growing. She heavily encouraged me to stop by the Archive to experience the famous Friday lunch and to see her work. I’m so glad she did. While enjoying a tasty lunch of sausage and salad, I listened to Archive staff members talk about their week and curious visitors who shared their inspiration for coming to the Archive for a meal and a tour. I did not understand all the technical vocabulary, but I was struck by all the individuals who were working together on a project which, prior to this day, I had only experienced as a website on my computer screen. Of course, I fell in love with Nuala’s sculptures as soon as we stepped inside the Great Room, where 100+ colorful figures stood facing the stage as if waiting for a performance or lecture to begin. The odd objects in their hands, their personally fashioned clothing, and their quirky expressions reinforced the idea that the Internet Archive was the shared, creative effort of a huge number of individuals. The technical was becoming human to me. By the time Brewster had brought his visitors back down into the common workspace, my mind was racing with ideas and questions. As a museum professional who has spent her career making choices about what works of art to acquire and preserve for future generations and as someone who takes great joy in handling and caring for objects, I wondered what threads ran from this digital archive through to more traditional archives and libraries. If I had sleepless nights wondering how to best protect a work of art for posterity, how was the Internet Archive going to ensure that its vast data was going to survive for millennia to come? Before I knew what I was doing, I heard myself telling Brewster that I would love to do an exhibition about the Internet Archive. I don’t think he or I fully registered what I was saying. That would take more time. This curatorial challenge brewed in my mind. The more I thought about it, the more I thought an exploration of the past, present and future of archives and libraries and the basic human desire to preserve knowledge for future generations would be a perfect topic for an exhibition in my university art gallery. I knew Nuala’s series could serve as the core artistic and humanizing element for such a show, but I wondered how I would be able to convey these ideas and questions in an accessible and interesting way, how to make this invisible digital world visible? And turning the tables—if Brewster had brought art into the world of technology with his commission of the Internet Archivists series, how could I bring technology into the artistic realm? When I approached Brewster for a second time about a year later with a proposal, he thought I was crazy. He has said it was as if I had told him I wanted to do “The Internet Archive, The Musical.” A few conversations and months later, he agreed to let me run with the idea. I have to admit, at times, I too wondered if I was crazy. I wrestled with devising ways to visibly convey the Archive’s unfathomable vastness while also trying to spotlight the diverse aspects of the Archive through hands-on displays. While some big dreams had to be let go, I was able to achieve most of the goals I set out for the exhibition. Transporting thirty-two of Nuala’s fragile sculptures to Los Angeles required two days of careful packing and a fine art shipping truck committed solely to this special load. Along with film editor Chris Jones and cameraman Scott Oller, I also created a film that documents the story of the Internet Archivists sculpture series through interviews with Nuala, Brewster and a number of the archivists who have had their sculptural portraits made. 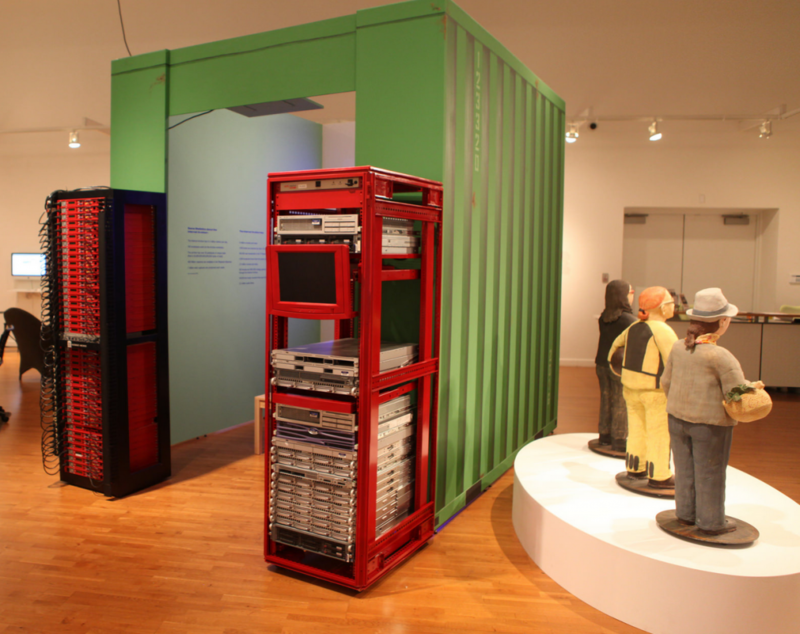 When visitors entered the gallery, they were greeted by three of the Internet Archivist figures and a full-scale shipping container (a trompe-l’oeil work of art by Makayla Blanchard) that conveyed Brewster’s often-repeated claim that he had fit the entire World Wide Web inside a shipping container. The exhibition was filled with juxtapositions of the old and new. To the right of the three archivists was a case filled with a dozen ancient clay cuneiforms and pieces of Egyptian papyrus introducing very early forms of archiving. A china hutch displayed out of fashion media formats that the Internet Archive has been converting into digital form such as record albums, cassette tapes, slides, and VHS tapes. I partnered with LMU’s librarians to bring the mystery of archiving out into the light. Using one of the Archive’s Tabletop Scribes, the librarians scanned and digitized numerous rare books from their collection. The exhibition also included displays and computer monitors so visitors could explore the Wayback Machine, listen to music from the archive’s collections, play vintage video games and test out the Oculus Rift. In the end, I think the exhibition asked a lot more questions than it answered. Nevertheless, I hope this first exhibition will spark others to think of ways to make the abstract ideas and invisible aspects of digital archives more tangible. Who knows, maybe, a musical is in the Internet Archive’s future. I was sad to pack up the clay archivists and say goodbye to their smiling faces. I’m sure they are happy to be back with the rest of their friends in the Great Room on Funston Avenue, but oh, the stories they have to tell of their travels to a gallery in Los Angeles. Carolyn Peter is the director and curator of the Laband Art Gallery at Loyola Marymount University. 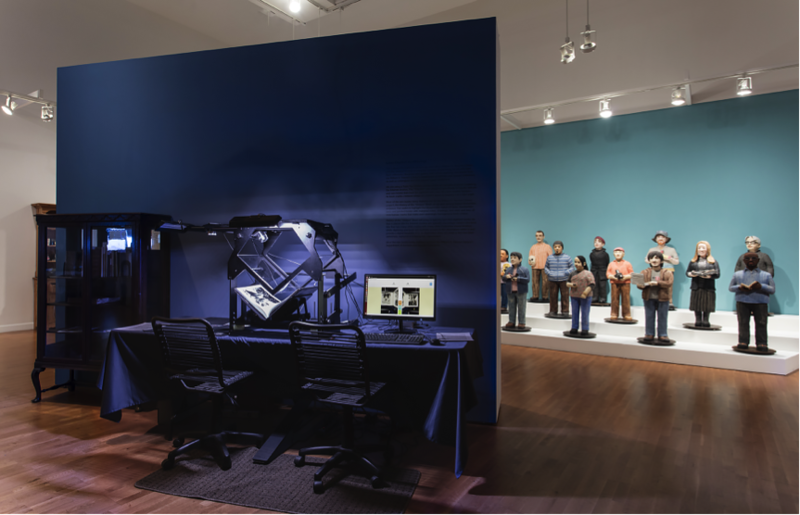 She curated From Clay to the Cloud: The Internet Archive and Our Digital Legacy, which was on view from January 23-March 20, 2016 at the Laband. This entry was posted in Announcements, Event. Bookmark the permalink.